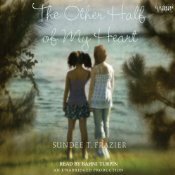 The Other Half of My Heart by Sundee Frazier, read by Bahni Turpin. Grades 4-6. Listening Library, 2011. 7 hours and 55 minutes. Review copy provided by my local library. Biracial twin sisters Keira and Minerva don't look anything alike. Keira is dark-skinned like her African-American mother and Minnie has blue eyes and light skin like her white father. Growing up in a small Washington State town, Keira is the one who always feels different and sometimes wrong. But when their grandmother insists on entering both girls in the Miss Black Pearl Preteen of America program in her hometown of Raleigh, NC, Minni will discover what it's like to be the one who doesn't fit in. And seeing the world from Keira's eyes will help her find the voice she so desperately wants to shout down injustice. I love the premise, but the story fell a little flat for me. I felt like it was slow going at the beginning without many opportunities for Bahni Turpin's excellent narration to shine. When the twins arrived in Raleigh, Turpin's voice for Grandmother Johnson brought me back into the story and that's what I liked best about the whole book. It slowed down for me again at the end when Grandmother Johnson wasn't as prevalent. And I think that shows you what I thought of the book overall, that even with this fabulous premise, the most interesting character was an adult. There were things about the book that I liked. I liked that it explores issues of race in our supposedly "post-racial" society. The book clearly shows that racism still exists. It's great to see biracial protagonists and the book really did make me think about race and ethnicity as something that's deeper than appearances. Even though Minnie looked white, she was just as much black as she was white. And even though Keira looked black, she was just as much white as she was black. My community's home to a large number of biracial kids and they need books that reflect their experiences, so keep 'em coming! I think where the book fell flat was in the character of Minni. The book was about her struggle to find her voice, to know and claim her own black heritage and to feel and understand racism. However, even with all that development going on, Minni was still the most boring character in the book. I never connected with her, never felt her frustration at not being able to speak out for what she believed (even though Martin Luther King, Jr. is her hero). Sundee Frazier tells us that Minni is all about social justice, but I never felt like that was shown to me. Like I said, Grandmother Johnson (a no-nonsense, retired Southern teacher) was the most interesting character to me. I, like Minni, was fascinated with her stories of being the first black teacher in a white school in the South. Keira was also interesting to me with her passion for fashion and her exuberant, outgoing personality. I feel like some plot threads were dropped with Keira, though. It's mentioned that she has dyslexia and struggles with reading, but nothing more is said about it after the middle of the book. Bahni Turpin's excellent narration saved this book for me. I would have put it down right about the spot where Grandmother Johnson comes in, but Turpin so brought Grandmother Johnson to life for me that I was intrigued and kept listening. However, there's not much opportunity elsewhere for Turpin to do what she does best and use voiced narration to bring characters to life. I'd recommend this book to tweens with a special interest in the subject matter. It's a nice, clean read for a true tween audience - upper elementary and younger middle school. The book also has tie-ins to the Civil Rights movement and would make for interesting discussions about race and racism in today's society. Especially consider purchasing this one where you've got an audience demanding books with biracial protagonists. Lee at Reading with my Ears has another review of the audiobook. The Other Half of My Heart is on shelves now!